Having the serial number for your Scotsman ice machine will allow you to determine the date of manufacture. Using the Scotsman website, you may validate the warranty, if there are any service updates, or check to see if the machine has been recalled. If you’re looking to purchase a used Scotsman ice machine, it will let you know exactly how old the unit is, but unfortunately, cannot tell you for how long it was actually used. This serial number number is also necessary if you call for service. A technician will want to know the ice maker model and the production date will help him to determine what replacement pieces to order should that be necessary. The production date code can be found within the serial number. Depending on the age of the machine, it will be displayed one of two ways. When you look at the serial number, for example 111111-07Y, the final two digits and letter tell you it was manufactured in January of 1992. These units use a code that has a two digit year, followed by a two digit month, then the site code for where it was manufactured, followed by six numbers. For example, the serial number: 0507132099887 means it was manufactured in July of 2005. For buyers, or sellers, having this information is important. 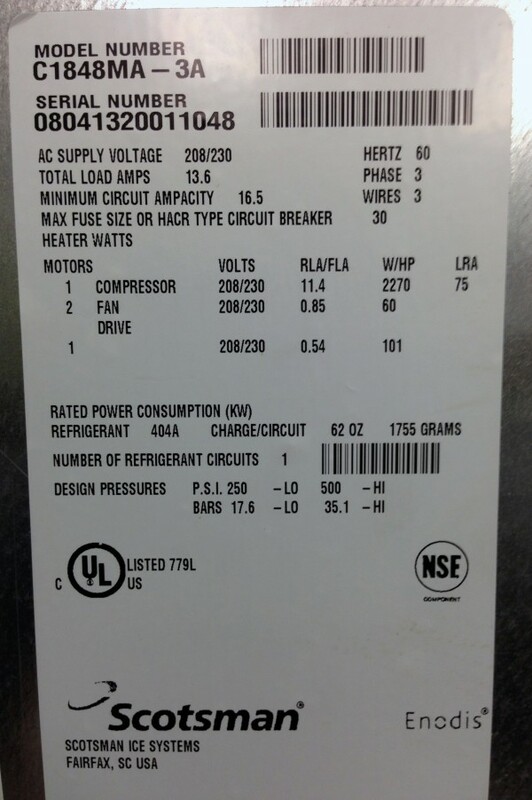 The serial number will indicate the age of the ice machine and can help determine its market value. As an owner of a Scotsman ice machine, it helps owners quickly determine service options by identifying if it is still under warranty or what part and labor costs might be. The model and serial number is always available on the machine, but we recommend copying this info and maintain a file for easy reference since most of the time it is inaccessible once the machine is installed.